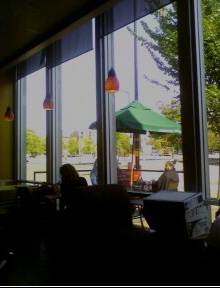 I am sitting in a Starbucks (surprised?) near Eastern Market on Capitol Hill in DC. The line for coffee has gone out the door so I’m waiting for the line to get a bit shorter. The Classmates are out roaming through the market and we’re thinking about doing a videocast, so we’ll see about that. At the next table is a man with two boxes of file folders that he’s carrying around. He’s obviously has some mental health issues, but I’ve never seen anyone walk around carrying two paper boxes of file folders. What happened to him? Is he a former Hill staffer that just snapped one day? He was sitting here, opened up one of the boxes and pulled out a 8 1/2 x 11 notebook and a pen and started writing, talking to himself as he wrote, but writing away. I could see he had written a lot before he arrived. He was dressed in one two many layers, but he had a long wool overcoat that perhaps would have been just the style on a winter’s day walking to the House side of the Capitol. He was thoughtful as he wrote and if it weren’t for the extra layers (and now that I think about it, the layers didn’t really match) and the overstuffed boxes, he might have been a staffer with a major project underway. But when I saw his face I knew that he had done a whole lot of living (and a whole lot of suffering) in the past few year, or two, or ten. As things got crowded in here, he picked up his two boxes (which were just completely stuffed with file folders) and walked out. But it’s hard not to wonder about him, to wonder what happened, he’s under care somewhere, or if he is just living on the street. Easter Market is like that. This is the first time I have been up here in years. For a long time Eastern Market was edgy, on the fringe between the upwardly mobile Hillites and the old neighborhoods in need of repair. Today it seems to be a eclectic mix of people, black, white, young, old, rich, poor, bohemian, bougoise, hip, artsy, sporty, buttoned up, I think I’ve seen all of them in the past hour here in Starbucks. This entry was posted in Videocasts. Bookmark the permalink.